I had a Mid-2012 MacBook Pro that recently stopped booting. I narrowed this down based on troubleshooting of the boot device to likely the SATA/hard drive connector/cable no longer working for whatever reason. I have decided to sell the system. I'd like to know if I remove the hard drive (or in this case, an after-market SSD I've installed) from the system, will there be any other data (i.e. iCloud data) stored on the system on any other chip that I can reset in any way? I plan to reset the SMC/NVRAM before I sell the system off of to someone else. Additionally, if I remove the hard drive, is the system still associated to iCloud (specifically Find My Mac) or any other service? If so, how do I disassociate it? The system will no longer boot even if I put in my boot device. I have decided to sell the system. I'd like to know if I remove the hard drive (or in this case, an after-market SSD I've installed) from the system, will there be any other data (i.e. iCloud data) stored on the system on any other chip that I can reset in any way? Unless you actually wipe the SSD clean, you could potentially leave all sorts of personally identifiable information on that drive. As for "data on a chip," there's nothing identifiable that stored. Apple uses your serial number and the MAC address of your network adapter to validate you to their services. Once you remove it from your account (see below), the hardware is now disassociated from you. I plan to reset the SMC/NVRAM before I sell the system off of to someone else. Reset the NVRAM, this doesn't store much - just pre-boot environment variables like where to boot from. It has nothing to do with iCloud. Additionally, if I remove the hard drive, is the system still associated to iCloud (specifically Find My Mac) or any other service? If so, how do I disassociate it? Yes. It's based on the Serial Number of the device. 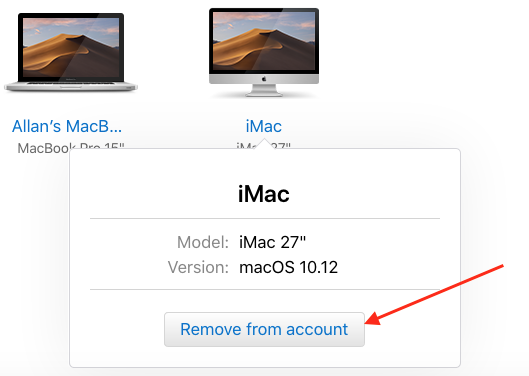 You can remove it from your account by logging into your AppleID account and removing it. You need to sign out of these as well. You go into your local settings and sign out of each service respectively. The system will no longer boot even if I put in my boot device. It will still boot from USB (if the drive is good). The best way to ensure that it's still good and it is in fact the cable is to hook it up via a USB to SATA adapter. If it is, you can wipe the drive and install a fresh copy of macOS on it.